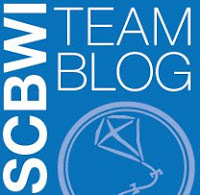 Blogging the 4-Day conference, as part of SCBWI Team Blog, was exhausting, exhilarating, and one of the best professional experiences ever! Thank you, SCBWI Team Captain Alice Pope, SCBWI Director of Communications and Creative Director Aaron Hartzler, SCBWI Executive Director Lin Oliver, and my fellow Team Bloggers Paula Yoo, Jaime Temairik, Jolie Stekley, and Suzanne Young, for letting me be part of this Magical adventure! So many moments swirl for me. The Air: Getting to learn from stratospherically talented writers who are so accomplished in their craft was heady! Linda Sue Park. Holly Black. Kathleen Duey. Ellen Hopkins. Melinda Long. And so. many. more! The Earth: Getting to listen to and talk with brilliant editors, and agents, and illustrators, and fellow writers - all of whom, like me, are passionate about children's books! That shared foundation of energy was energizing and so much fun! We - the children's book community, and the members of SCBWI, are part of a tribe, and I felt - more than ever before - that I have found MY place. My people. My friends. The Fire: I feel so inspired! All the advice, and writing tips, and career counsel, and brainstorming, and writing exercises... I want - no, I NEED - to write! And in the alchemy of the past four days at the LA SCBWI Summer Conference, all five of these elements came together... and I had a BLAST! I know that it will take me the better part of the next two weeks to process through all the amazing things I experienced. For today, here's one photo I truly love. It shows one of my conference Highlights: My Story's Spine getting a Chiropractic Adjustment from Holly Black! #SCBWI09 - The SCBWI Summer Conference - was magical for me. I hope it was transformative for you, too. And if you weren't able to make it, check out all the amazing information here and on the official conference blog for a taste of it. And hopefully after that taste, you'll be inspired to come to the next one. And you'll get to experience the full BLAST of magic, and of SCBWI, yourself! A big hat tip to you and the other Team Bloggers from me, Lee. Y'all were everywhere and always having fun, too. A great service, and I hope you all know how much it was appreciated by folks AT the conference as well as those who couldn't make it this year. Thanks for keeping us all updated! The blog and the twitters were fabulous. Thanks for all your hard work and the notes on each class. And isn't Holly Black great? I loved talking to her. She's a wonderful person. Thanks for all the work you did to let those of us who couldn't attend at least get a taste of the wonderful feast offered at the conference. I've enjoyed reading all the blogs and tweets I can find.